Topping trade on the day at 16,000gns was Islavale Irish, bred by W S Stronach, Berryleys Farm, Grange, Keith, Banffshire, AB55 6LN. A Curaheen Giant son out of a Clonagh A Super Star daughter. Purchased by Backmuir Livestock, Backmuir Farm, Keith, Banffshire AB55 5PE. Second top price on the day of 14,000gns was Rockytop Invader 17, bred by Gary & Angela Christie, Birchfield, Glass, Huntly, Aberdeenshire, AB54 4XS. A son of Crugmelyn Brenin out of a Corskie Wham daughter he was purchased by J MacIver, Wester Coltfield, Forres, Moray IV36 0UB. 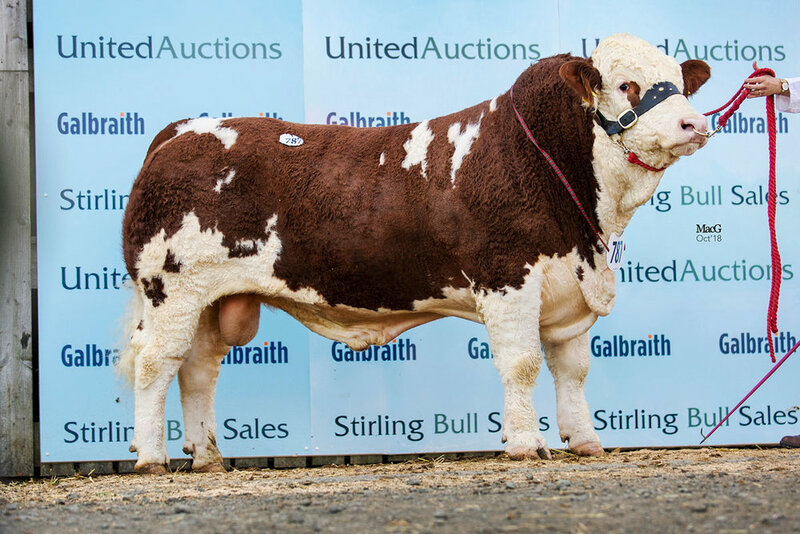 Also selling at the 2nd top price of 14,000gns was Saltire Impressive, bred by J & G Houliston, 10 Newmains, Drem, North Berwick, East Lothian EH39 5BL. A son of Woodhall Ferrari, out of a Saltire Arnie daughter, he was purchased by Noel Kilpatrick, 91 Dromore Road, Banbridge, County Down BT32 4EF. Following on at 13,000gns was the Reserve Overall and Intermediate Champion Blackford Iolair, bred by Mr W G MacPherson, Blackford Farm, Croy, Inverness IV2 5PS. A son of Kilbride Farm Doubleaction, out of a Kilbride Farm Strabane daughter. Purchased by Mr H Brunton, Crudie Farm, Arbroath, Angus DD11 2NR. Two bulls then traded at 11,000gns, the first being Overall & Junior Champion Drumacritten Ian, bred by Mr W E Nelson & Mr G E Nelson, Drumacritten, Rosslea, Enniskillen, County Fermanagh BT92 7TU. A Dermotstown Delboy son, out of a Dripsey Super King daughter, he was sold to Messrs C & M Bruce, Tillyeve, Udny, Ellon, Aberdeenshire AB41 6SJ. Next at 11,000gns was the Reserve Junior Champion Islavale Imperial, bred by W S Stronach, Berryleys Farm, Grange, Keith, Banffshire, AB55 6LN. This Curaheen Drifter son, out of a Popes Laird daughter sold to Backmuir Livestock, Backmuir Farm, Keith, Banffshire AB55 5PE. Selling at 10,000gns was Scotland Hill Invader, bred by Mr Thomas Hill, 1 Mill Farm, Daw Lane, Wadworth, Doncaster DN11 9DX. This Glenturk Extra Special son out of a Popes Barclay daughter was purchased by Pitgaveny Farms, Pitgaveny, Elgin, Moray IV30 5PQ. Three bulls then traded for 8500gns. Reserve Senior Champion Ranfurly Impeccable bred by Mr W D Hazelton, Cohannon House, 25 Bovean Road, Dungannon, County Tyrone BT71 6HR. A son of Raceview King, out of an Hillcrest Champion daughter sold to Mr & Mrs AS & YA Leedham, Rowan Farm, Lockton, Pickering, North Yorkshire YO18 7NU. Next at 8500gns was the Reserve Intermediate Champion Hiltonstown Irish, bred by Richard Rodgers, 13 Race Road, Portglenone, County Antrim BT44 8EP. A Dermotstown Delboy son, out of a Woodhall Premier daughter, purchased by Heather Duff, Pitmudie Farm, Menmuir, By Brechin, Angus DD9 7UH. Again, at 8500gns was Islavale Innis, bred by W S Stronach, Berryleys Farm, Grange, Keith, Banffshire, AB55 6LN. An Atlow Dixon son, out of a Curaheen Bandit daughter, he sold to J & J Marshall, Daleigh, Advie, Grantown on Spey, Morayshire PH26 3LP. Female Champion was Broombrae Cathy I10, bred by Mr G L Clark, Broombrae Farm, Auchtermuchty, Cupar, Fife KY14 7EE. A daughter of Peasiehill Englebert, out of a Corskie Copper daughter. 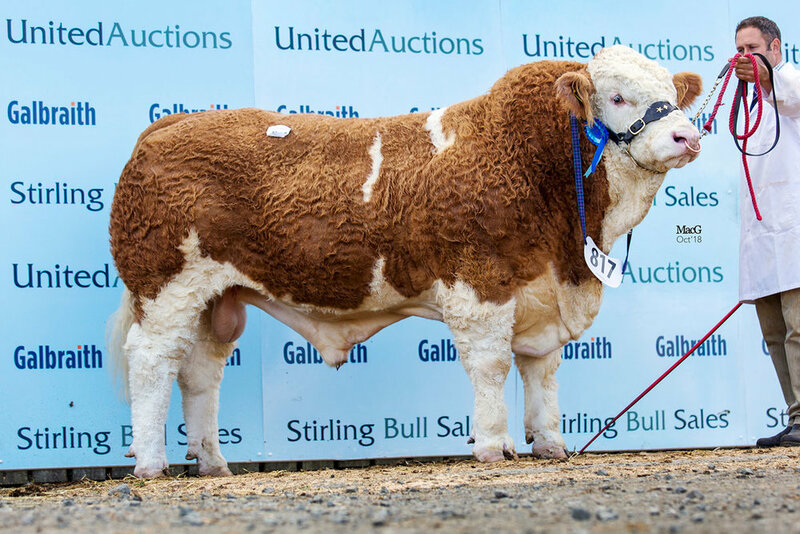 Sold for 3000gns to John Lathangie & Son, Pyeston, Markinch, Fife KY7 6LN. Simmental bulls fetched a top of 16,000gns at Stirling, with 69 selling to average £6187 (+£467 on the year), a 79% clearance rate. Meanwhile, 20 females also sold, to level at £1751. The Mendick herd dispersal saw a top price of 5200gns for Mendick Cara (P), a Thursford Viceroy daughter, out of a Dirnanean Paramount 2nd daughter , she sold with her heifer calf at foot to the McNees, Over Finlarg Farm, Tealing, Dundee DD4 0QE.